Before I go any further, I should probably explain what each of the battlin' boxers does because as I mentioned before, it's one of the most overlooked archetypes of recent sets. so without further adieu, let's start the overview of each monser. First up, Glassjaw, he destroys himself when targeted for an attack (sort of a kamakazi if you will). This triggers his second effect which adds a battling boxer to you hand when he is sent to the graveyard by a card effect. so there are many ways to utilize this effect. Even detaching him from an xyz monster triggers the effect. Next up we have switchitter, one of my personal favorites, this guy allows you to special summon a battlin' boxer from the graveyard when he is normal summoned, which allows for a quick xyz summon. One of the ways we get to switchitter is through headgear, which sends a battlin' boxer to the graveyard when he is normal summoned and can't be destroyed by battle once per turn. Next up is counterpunch, who is the gem-merchant of the deck; meaning he increases a battlin' boxer's attack point's during the battle phase by banishing him. From where you might be asking? well he can banish himself from the hand OR the graveyard so he can help deal massive damage. The Final effect monster is sparrer. Sparrer acts as the kizan of the the deck allowing himself to be special summoned when there is another battlin' boxer on the field at the price of giving up your battle phase (that's why we only play two.). Next we move into the xyz monsters of the archetype. Battlin' Boxer Xyz Monsters. Broken or Not? You Decide. 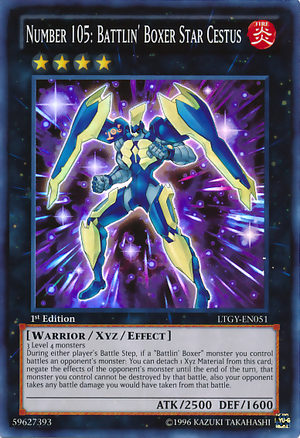 As of right now, there are three very good xyz monsters for the Battlin' Boxer archetype. They are Lead Yoke, Number 105: Battlin' Boxer Star Cestus, and Number C105: Battlin' Boxer Comet Cestus. Let's go through each of them. As you can see to the left, Lead yoke is pretty amazing. detaching to save a battlin' boxer and gaining attack points. this effect can be very good in certain situations such as dark hole or torrential tribute, and the attack boost is permanent. Up next, we'll take a look at Number 105: Star Cestus. As you can see to the right, star cestus is pretty impressive right, but what about C105 Comet Cestus? Well, I don't have enough room here to show you his picture, but I can describe his effect. Comet Cestus's first effect is similar to the effect of Elemental HERO Flame Wingman (Hero players remember him right?). but what about his second effect? well, if he has Star Cestus as a material he gains an effect similar to Number 61: Volcasaurus's effect. He destrooys a monster and deals damage equal to it's attack, but he can still attack. So I'd say Comet Cestus is pretty impressive. A majority of the deck is very standard however, there are a few cards in the main and extra that are somewhat...unusual. One of those cards is Thunder King Rai-oh. Now i know he doesn't let you search with Rota or duality, but more often then not, your gonna see him before or after those cards. The next card I would like to talk about which is gaining more and more popularity, Rank-up Magic Barian's Force. this card allows you to rank up Utopia or Number 105 into Number 39: utopia Ray V or Number C105: Comet Cests. Most people don't consider using this card because it is a waste of space, but I personally like it and know other people who do as well, and Number C105 is actually really good.. Those are basically the only unusual cards in the main deck, any others are self-explanatory. Next we have the extra deck. More than half the extra deck is fairly standard, there's only about two cards that you wouldn't typically find in this deck, which is Utopia Ray V and Paladynamo. Number C39: Utopia Ray Victory is in here as an extra target for Barian's Force because you aren't always gonna have Number 105: Star Cestus on the field when you draw rank-up magic. Starliege Paladynamo is in the deck because there will be times when you have a dead thunder king and a dead photon thrasher on your field. The play style of the battlin' boxers seems to be very aggressive, but at the same time very combo oriented. At the same time, it seems to be based on getting to the bigger monsters quicker while gaining hand and field advantage using the graveyard as sort of a stepping stone. The play style of the battlin' boxers somewhat reminds me of the play style of the great nature clan in vanguard, powering each other up and gaining hand advantage. One main weakness of the deck that I would like to point out would be the fact that many other decks can out speed it such as dragon rulers and prophecy, which is one of the reasons why Thunder King Rai-Oh is in the deck. Another key weakness is hat hey can easily be countered by cards like compulsory evacuation device, necrovalley and other monster effects, spells, and tras, which is why there is so much back row hate and monster removal in the deck. Battlin' Boxers are such a fun archetype and yet they are so competitive. I recently learned that there were three battling boxer decks at the Poland national tournament. As much as I would like to know the deck lists, I highly doubt they topped, but still I'm glad to hear that at the very least that people tried to use them at such a high level of play. I can't wait to see where they go when the new support comes out. Until next time duelists, play hard or go home! 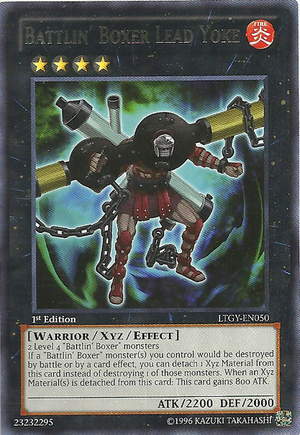 The battlin’ boxers, very overlooked and incredibly under appreciated, the first thing that is noteworthy is number 105 is not the best monster, Lead Yoke has far greater power. The other thing to note is battlin’ boxers are fire attribute opening up more possibilities, for instance flamevell fire dog can search glassjaw. Also tachyon produced another very powerful yet overlooked card the magnum shield which provides extra power to these warriors. I have worked for months on this archtype working out kinks and devising new strategies. What I have created may very well be one of the best builds for this archtype. While it may not be able to stand against dragons or prophecy, I have been able to defeat several tier 2 decks. with the new format just around the corner I believe it has what it takes to be a nice cheep tier 1 deck, with the total needed cards coming around to $30 in total value. I will post my deck list tomorrow along with tips, strategies, and some optional cards. What about the side deck? figured I didn’t really need a side deck for this since the article was about the archetype. but you could probably side fairly generic warrior support and other cards that shuts down dragons, prophecy, evilswarms etc. oh and chalice, lance, and even breakethrough skill. Expected Mike Tyson to write the first article on this archetype. I guess that’s hoping for too much. The second I saw 3 Mystical Space Typhoon in the deck I kinda had to stop taking this decklist seriously. I haven’t seen MST run in almost any deck since Dragons hit and many traps don’t even hurt this theme. Throw in some Blasters instead and give the deck some real power and a out to almost anything. The theme doesn’t work without effect negation this format either. They will just Big Eye or Bahamut your boss monster. Veiler, Chalice, Breakthrough, and so on are all good options. Just a pair of Fiendish Chains won’t cut it. And Number 105: Battlin’ Boxer Star Cestus, Number C39: Utopia Ray V, and the Rank-up stuff is just a random inconsistent waste of cards. “Even detaching him from an xyz monster triggers the effect.” At least look at the wiki for proper rulings before you right a article or point out that that only works with 2 Xyz monster in the whole game. But I’m sure you’ll get that pointed out over and over again in the comments. You really need to start over on your decklist/article. It seems like you haven’t seriously play tested this theme at all in our current format. Lots of people who aren’t surrounded by Dragon Rulers, Prophecy and Mermails are still running Typhoon in the main deck. It was just the mistake of the writer to not note that he’s playing the deck in an alternate meta. Everything else though I agree with you on. Like mentioned above, I play around a lot of people who play stuff like fire fist, rabbit, and constellars, and I still feel the need for two to three. also, this deck really hates cards like skill/mind/soul drain. Strongly consider Forbidden Chalice in this deck. It combos incredibly well with Glassjaw, and gives you more effect negation. not sure if I would main deck lances or chalice. I would definitely consider siding them. I agree with the lance, if anything you could side it. Chalice is a possible main deck tech choice. Also, this is only a preliminary build. An article that I typed up last night has the updated list and the article should be up any day now i hope. Glassjaw only gets his effect if detached from an effect of an XYZ (Maestroke, Lead Yoke) Not by the cost of an XYZ. For the same reasoning Dark Worlds don’t get their effects if discarded as cost. sorry. messed up my wording a bit.